In most of the South, grilling season stretches from the earliest sign of spring through the end of football season. During the hottest months, grilling is a practical way to keep the heat of cooking outside. But during the other months of the year, it’s an easy way to entertain. The machine at the heart of this tradition is as recognizable as it is useful. When it pops up on television, the boxy or domed grill is always at the center of the party. The host operating it is quick with a corny joke and sips a beer or a citrusy beverage to take the edge off the heat. Despite their differences in fuel source or shape, most of these grills work roughly the same way. But one entrepreneur wants to change the way we cook outdoors. 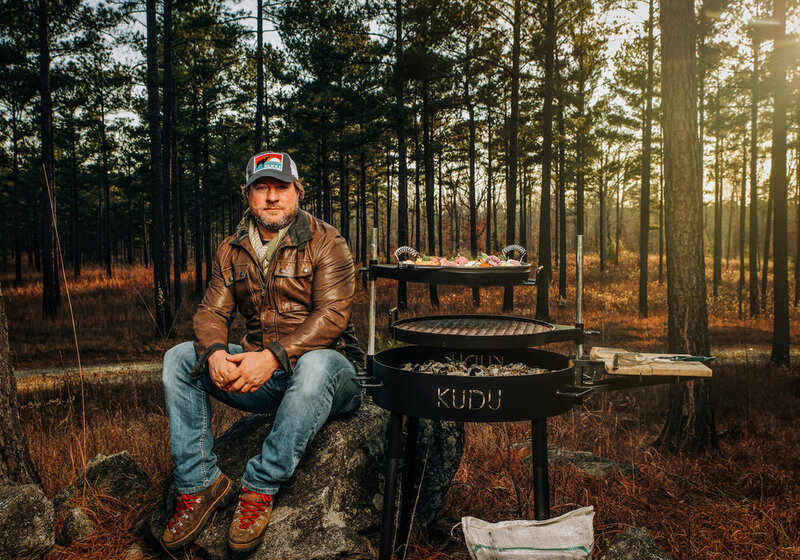 Stebin Horne, creator of the KUDU grill, wants to bring—and meld—the South African tradition of braaiing with the South’s rich history of barbecuing. This wood-burning grill combines a fire pit with an adjustable griddle and cast iron pan. Stebin’s design allows users to cook a variety of things at the same time, while the base doubles as a visually pleasing fire pit. Braai is best explained as a sort of barbecue. Braai is also the word used to describe a gathering around food made this way, or it can be the verb that describes how the food is cooked. South Africa has 11 official languages on the books, and braai exists in each of them. It’s such a fundamental part of the culture that a movement to rebrand the country’s Heritage Day, September 24, to Braai Day was a success. The wood-fire aspect of KUDU grilling adds depth of flavor to the food and allows it to cook evenly. 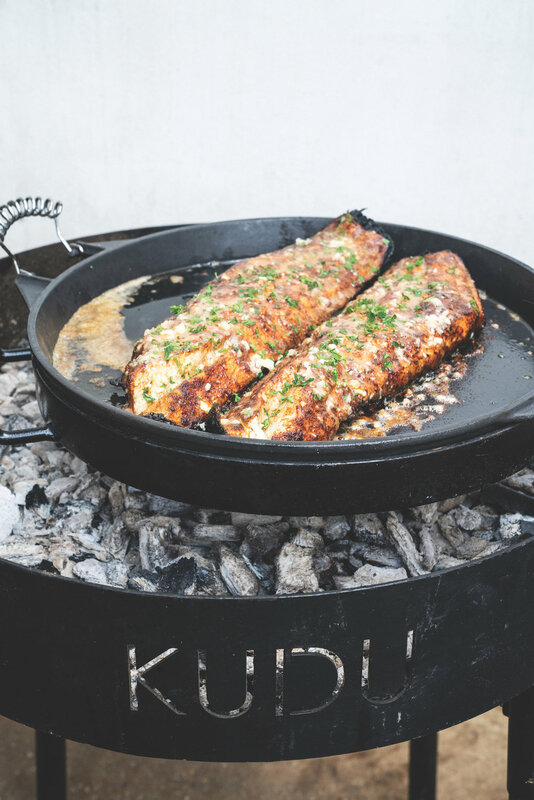 Instead of relying on the size of a flame for the temperature, the KUDU grill allows the user the mobility of moving the food being grilled closer to, or farther away from, the fire. These attachments also provided the basis for the grill’s name, since they resemble the spiral horn of the male kudu, a species of African antelope. For Southern chefs who’ve encountered the KUDU, the flavor advantage has rendered it a new tool, especially for home cooking. Many of these chefs first encountered it at the Auburn Oyster Social. Stebin donated the use of seven KUDUs for the grill out, and the chefs were impressed. Stebin’s inspiration for the grill and his brand was as much the culture surrounding the braai as it was the food. With technology making its way into all parts of our lives, he says, it can be difficult to make meaningful connections, even as it’s easier to connect with people all over the world. Stebin hopes that the KUDU will help get people off their phones and into real conversations. This mantra strikes a chord with buyers. Demand for the KUDU grill has been so overwhelming. Stebin believes that this popularity is due to the camaraderie and experience that the grill inspires.